I have 2 email accounts (EmailA & EmailB) and two subfolders (FolderA & FolderB) under my INBOX folder where mail for each account. I'm using rules to move the mail to the correct folder: specific words under sender's (emailA) and recipient's (emailA) address and move it to FolderA. It works well for mail that belongs in the subfolders but my attempts to move mail not addressed to either address results in 2 copies of those messages. When rules result in duplicates, it always indicates the user is not using the Stop processing action on each rule. My impression is that most users think it means 'stop all rules' so they don't use it. Instead it means 'stop processing this message, move to the next message'. Rule 3: Do something with the mail that is left. The first two rules each move the messages and Stop processing tells Outlook that it should not check the message against any more rules. 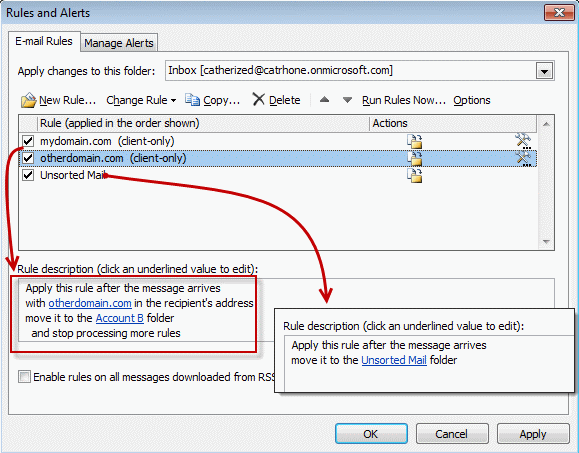 Conversely, if you want to a message to be processed by more than one rule that might apply, you want those rules at the top of the list (since Outlook runs rules in the order they are listed in Rules Wizard), without stop processing selected. Rules that should be the final rule to process a message will have the Stop Processing action. Frequently asked question about Outlook's rules wizard. How about a way of sorting rules? Seems to me that for over twenty years people have asked MS for a way to sort rules in order that duplicates may be removed. But no, they have to be done one by one. Fine if you only have a few but when there are over a hundred or so almost impossible. They haven't really put a lot of effort into the rules wizard - but one reason for not sorting is because rules are ordered in the order they are to be run. If you sort alphabetically, you need to keep track of the original order so you can go back to the original order. Sperry Software has a utility that will sort rules - he's actually the only one whose done it, which should give you an idea of how hard it is to work with the rules - popular requests get a lot of people looking to make money on an addin. "When rules result in duplicates, it always indicates the user is not using the Stop processing action on each rule." Yeah, well, when i used that, i only received ALL messages in one folder. (no duplicates, that's true....) I Have used years and years rules, since 1998, but now its a chaos. Why changing things if things worked good???? Unbelievable MS....Any solution? Rules haven't changed much over the years - it's still the same basic rules engine as before. The last update was in 2003. Hello, I am having issues with people receiving double messages. We have a generic unit email set to automatically redirect to our entire group. However, sometimes we receive messages addressed to both our generic email and people included in our re-direct group. We are trying to figure out a way that the email will forward to everyone in the group but those who said email has also been addressed to. We have tried the "except if" rule but the issue is those not listed by the sender do not receive the message. Is what we are trying to accomplish even possible?? Is there a way to add a condition to the "Do the Following?" Thank you in advance for your time and consideration. Are you using Outlook 2016 and a pop3 account? It's probably a bug. Go to file, office account - office updates, Update now. The problem when wanting to applying multiple rules to an email is that Outlook seems to be really really bad at math. Having finished high school like many others, order of operations (BEDMAS) would seem like a logical thing, but Outlook is really bad at it. Instead of applying Rule A on the message, then checking if Rule B applies, then applying Rule C, Outlook seems to try to apply rule ABC on every message at the same time. This defect in how Outlook processed rules creates copies of messages instead of moving them. It runs them in order but doesn't drop the original message until all rules are processed. If moving a message caused the rules to stop, then you wouldn't get duplicates but it holds the message until it is sure nothing else will work. I have a rule that looks for specific words in email. Upon finding them moves to a folder. I have stop rules as the last line of the rule. I get three duplicate emails in the folder. I have deleted the rule and done it again. Still getting same thing. If I stop the rule, I get only one email in the inbox. Outlook 2016, windows 7.
is there any way to stop procesing to avoid duplicates in outlook 2007? What happens when users A, B, C were cc'ed the email A and they all have Rule #1 which would copy email A to a public folder? would Rule #1 create duplicate emails in the public folders? Yes, it would create duplicates if each person had a rule to copy to the same public folder.